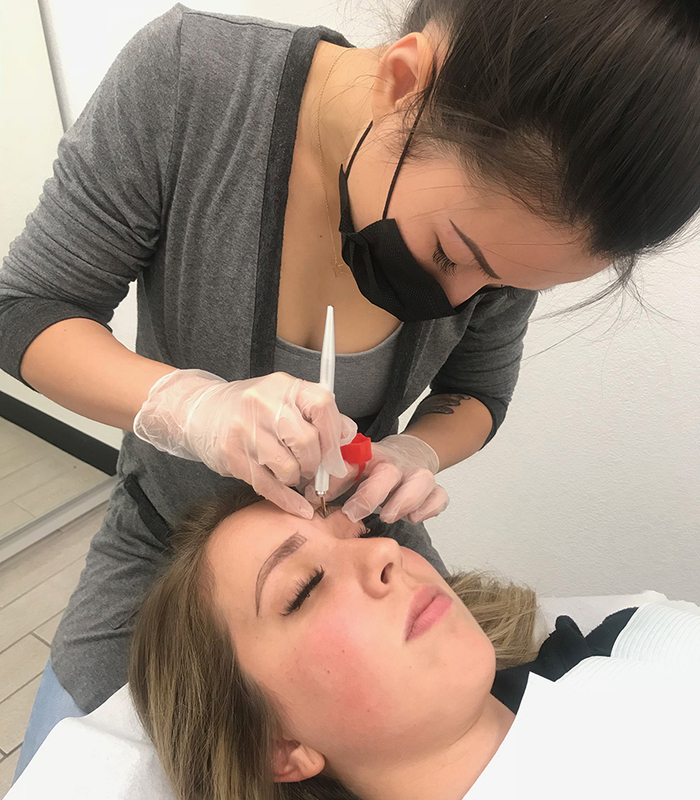 Studio 21 Tattoo is adding the artistry of microblading permanent makeup by Alieen Fang to our list of services in the tattoo studio. As of April 22, 2018 she will be taking appointments for permanent make up proceedures. Aileen has been an employee with Studio 21 Tattoo for the last year offering outstanding customer service and will continue to do so as she splits her schedule between microblading (eyebrows & eye liner) in addition to helping our clientele with their tattoo needs. We are proud to have her in the studio offering additional services, which our clients have been requesting for quite some time. We are excited to begin this new phase of our business. Your eyebrows are one of the most prominent facial features, so if you’re not satified with your current brows, you have options to achieve the natural look you always wanted to flatter your unique facial features. The process of semi-permanent micro blading provides a way to camouflage missing hair by depositing small deposits of pigments in the outer layer of skin to achieve great looking brows. Microblading is a meticulous artful process involving extensive measuring, choosing an eyebrow style and drawing on individual hairs. Microblading can illuminate brow imperfections such as bald spots, gaps, sparse patches and provide symetry. Imagine waking up everyday to beautiful flawless eyebrows without pencils and powders and illuminating the time consuming process of drawing on brows from your daily routine. Microblading creates a fresh natural younger more refined look and a worthwhile investment. There is a difference between an eyebrow tattoo and microblading. Eyebrow tattoos are a permanent procedure, which uses a machine to penetrate pigment deeper into the skin producing a more permanent look. Microblading involves using a small hand tool with nine or more tiny needles to create shallower cuts on the skin which allows cosmetic pigments to seep in. Microblading lasts one to three years depending on your skin’s pigment retention. If you are not wanting to make a permanent change, then microblading (semi-permanent makeup) might be the direction you are looking for. Microblading is a low maintenance, smudge proof solution. Analyizing a client’s hair color, eyebrow growth patterns, skin undertones, bone structure and facial features are all part of the microblading process to determine the proper eyebrow choice for you. The healing process is very important and requires a longer period of time to heal than tattooing. Microblading is a two step process and will make the difference in the longevity of your new brows if you follow the aftercare for the proceedure. Email for information: info@studio21tattoo.com, please state “Permanent Make-Up” in the subject line. Information to educate everyone about the Microblading services are listed below. Skin is cleansed of make-up, products, etc. Explanation of procedure, aftercare information, side effects, client preferences, etc.